Intermodal freight volumes returned to growth in first-quarter 2017 following last year's declines, the Intermodal Association of North America (IANA) announced yesterday in its Intermodal Market Trends and Statistics Report. First-quarter international containers rose 2.9 percent to 2.1 million units, and domestic containers climbed 1.3 percent to nearly 1.8 million units compared with first-quarter 2016. Intermodal trailers posted a slight gain of 0.3 percent to 310,393 units in the quarter. Overall, intermodal volume totaled 4.2 million units, up 2 percent year over year. "All intermodal market segments showed improvement in the first quarter," said IANA President and Chief Executive Officer Joni Casey in a press release. "What's notable about this is that it comes on the heels of 2 percent growth in the same quarter of last year, suggesting real gains, not just a weak comparison." The seven highest-density trade corridors posted a collective 2.1 percent increase in Q1 compared with the same period a year ago. Those corridors account for 63.4 percent of total intermodal volume. Gains elsewhere varied, ranging from a 7.4 percent increase between Eastern and Western Canada, to a 1.3 percent loss in the South Central-Southwest corridor. The corridor with the highest volumes, the Midwest-Southwest, grew 1.7 percent. Starting in Q1 2017, the IANA report will highlight additional information on specific quarters. In Q1, the focus was on international container growth. Of the top five corridors contributing to international volume growth, shipment gains were reported in the East to West lanes. Midwest-Southwest moves rose 19 percent, the highest share of international volume growth, followed by he Northeast-Midwest at 13 percent. The Eastbound Western Canada-Eastern Canada lane experienced 13 percent gains. 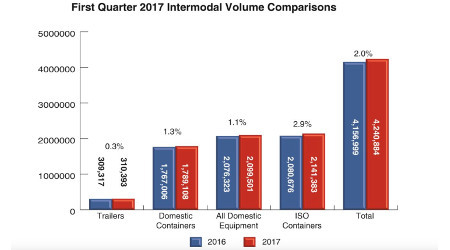 Intermodal marketing companies (IMCs) registered a 7.5 percent gain in total loads for the quarter, "reflecting the continued strength of highway shipments," the report stated. "These increased 11.6 percent over the same quarter the previous year," according to the report. "Intermodal loads also gained 3.6 percent after a double-digit drop for the full 2016 year."